If no one objects, does that mean it’s okay? I have asked Goodreads, both via email to Support @ Goodreads dot com and via public posting on the official Feedback forum, if it is all right for professional book promotion companies/individuals to post reviews of their clients’ books without disclosing the nature of the relationship. I don’t think there’s any question that Kelsey McBride is a book publicist. Here’s a screenshot from her website. Again, right out in the open, no deception involved. Back in August 2014, I discovered that one of Kelsey’s client, Mr. Edgar, was rating his own books without acknowledging that he was the author. As you can see by the above profile, he is not a Goodreads Author. At that time, he had rated — but not reviewed — five books, all 5-star ratings. As you can see, two of them were his own books. I flagged Mr. Edgar’s profile, and he was turned into a Goodreads Author, with the appropriate profile. Kelsey McBride, whom one assumes Mr. Edgar paid for her services, also posted a review of his book. That is hardly “full disclosure,” since it seems unlikely Ms. McBride would have put Mr. Edgar on her website as a satisfied client if all she had done was accept a free copy of his book and write a review for Goodreads. What Ms. McBride didn’t do, however, was disclose any of that information on her Amazon review of Mr. Edgar’s book, which she posted posing as “Country Girl” on 5 May 2014. Would you like the last little shred of doubt removed from your mind? Here you go, taken from the fiverr account of one of our favorite shills, Cailin Koy, whose accounts have been removed from Goodreads three times but who remains a top Amazon reviewer. Goodreads is carrying water for Amazon and apparently, like Amazon, has no ethics left. This is one very special author, many thanks to Linda for finding her. As I wrote a few weeks ago, I feel a bit out of place on BookLikes, because I just don’t do that much reviewing. But I have such enormous respect for the international block of reviewers that I sometimes just sit in awe as I stroll through the reviews on my feed. I wish I could express myself in German and Polish and French and Dutch and Italian to thank all of you, but a plain ol’ American “Thanks!” will have to suffice for the moment. Over the past several months, my examination of the reviews coming from the paid shills at fiverr has made me wonder a little bit about the motivations on non-paid reviewers. I’m sure there are at least a few readers who write reviews because it’s a legitimate way to get free books! I completely understand that motivation! Before that, however, there has to be a sincere and passionate love of books, in all their forms. Hardcover, paperback, audio, ebook — the lure of story pulls the reader in and the lure of community pushs her to share the experience. As members of that community, we each get a taste of that experience, and then can decide if we want to go further and make it our own. Both here on BookLikes and on other sites, we expand our experiences with books, with stories, with life, and if we don’t always all agree on a particular book or even on a particular non-book issue, we more often than not are able to disagree with respect. At the bottom of that respect is an understanding that honesty is the coin of the realm. Even when we’re wrong — as I was, and horribly so, a few months ago — we have the integrity to admit our errors and move on. My records of the paid reviews/reviewers on Goodreads show that approximately 80 accounts — at least — have been removed from membership. Some of those represent individuals who had more than one account or returned after one banning to make a second, third, or even seventh account. The number of text reviews, no-text ratings, likes and Listopia votes is way beyond counting. I gave up even trying to keep track of them when the number reached 6,000 reviews, and I hadn’t begun to tally the other ways in which the shills manipulated the Goodreads algorithms. Of the accounts that have been terminated, several belonged to Goodreads authors because they were also fiverr sellers. To date — it’s currently Sunday, 7 September 2014 — no Goodreads author has lost her or his account due to buying of fiverr reviews. Even though Patrick, Director of Author Marketing (or whatever his official title is) hinted that authors could be deleted if they were buying fiverr reviews, not one has been so terminated. Nor has a single reviewer’s account been removed by Amazon for posting fiverr reviews, despite numerous reports with copious evidence that the reviews are in blatant violation of Amazon’s prohibition against commercial reviews. Frustration with Goodreads’ lack of action of this issue prompted me to announce publicly that I would no longer spend my limited free time doing their job for them. I would not track down the information, collect the screen shots, do the leg work to clean up their site of fraudulent — and illegal — “ads” masquerading as customer reviews. I didn’t say I’d stop doing it; I just wasn’t going to give the information to Goodreads any more. I was, shall we say, moving house. And in doing so, I was going to turn my attention to the authors who are providing the funding for fiverr, the ones who are buying reviews they know are not honest. In the process of my research, I came upon one particular author whose growing dossier had me constantly shaking my head in amazement. I wasn’t sure what to do with the information, so I let it accumulate in the hope that eventually I’d know when and where and how to present it. I think the time is now. Readers, reviewers, fellow authors, meet Ms. Sandy Nathan, Goodreads Author. I’m not going to provide a link because you can easily find her there, and then again, she may not be a GR Author for long. Here’s another screen shot, this time of one of her book pages. The publisher is Vilasa Press. Note that the sidebar only lists “Author,” not “Authors.” In fact, Sandy Nathan is the only author published by Vilasa Press. Barry Nathan, presumably her husband, is the Publisher. Vilasa Press and Sandy Nathan, Author, are essentially one and the same. Sandy Nathan is a self-publishing author. Screen shot dated 2 August 2014. Fiverr seller is “Jessica_suave” who reviews on Amazon as “J.C.” and used to review on Goodreads as “Jessica” until her account was canceled. Note also that the vilasapress avatar is the same photo as Nathan’s Goodreads avatar, as shown on this double-5-star rating of one of her own books. All this was bad enough. 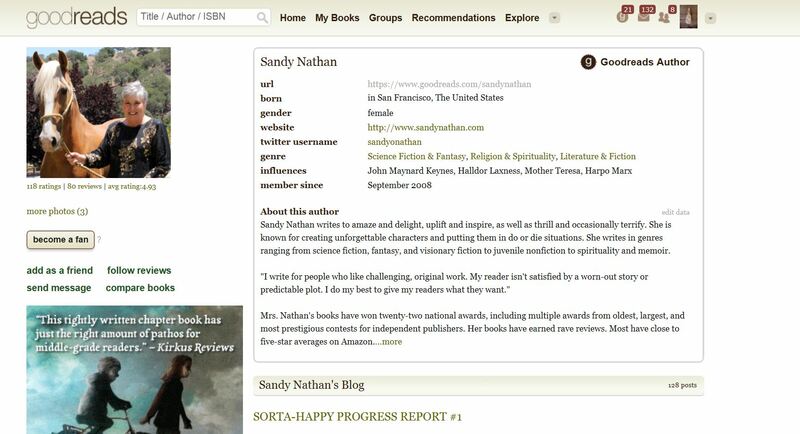 Author Sandy Nathan was buying reviews from fiverr shills. She had seen some of those reviews disappear from her book pages on Goodreads. Apparently she then stopped overtly buying reviews, but it leaves all her other reviews under a cloud of suspicion. For example, one of her enthusiastic reviewers is Tammie L. Smart, aka T. Lynne. Tammie Smart under that name reviewed her own book without disclosing she was the author. After Goodreads was notified, they combined the accounts to show the relationship. Smart, in partnership with her mother, operates a promotions/network marketing business of some sort in Canada, The Smart Team. Did Sandy Nathan buy ads/reviews from them as well? When an author has been shown to be buying some reviews, all her other reviewers lose credibility no matter how innocent they may be. An ethical author would take that into consideration — but I think it’s becoming rather obvious that Ms. Nathan may have a slight shortage in the ethics inventory. She certainly has no regard, let alone respect, for reviewers. Except, perhaps, those she has paid to do her bidding. On 23 July 2014, Ms. Nathan posted a lengthy screed on her blog, which was then fed to Goodreads, where I read it in open-mouthed shock. Seriously. I had read some arrogant spewings before, but this pretty much took the entitlement cake. Therefore, I feel at ease writing about reviews from an author’s point of view. I would like to do a bit of teaching, enlightening readers about writing reviews and some pitfalls they may leap into, only to feel silly/stupid later. I’m not going to teach readers how to band together in semi-feral groups, organize and attack authors with the intent of sinking books and destroying careers. Those of you prone to do that already know how to do it. If you’ve picked your jaw up off the floor, you may read on. Ms. Nathan goes on to describe good reviews, bad reviews, good bad reviews, and bad bad reviews, always of course from the perspective of the author. Bad bad reviews are those that say bad things about the author, such as she didn’t do her research, and say it in a nasty tone of print that hurts the author’s feelings. Apparently she believes reviews are only for authors, because a review that doesn’t make her feel good about herself or help her make herself feel even better about herself — which might be difficult to do, seeing as how she feels she’s pretty damn awesome — is not and cannot be a good review. It’s all about her, you see. Some review platforms, Amazon, I understand, allow authors to get such defamation down, if they work hard enough. Other review sites are bloody free-for-alls with no author recourse. What triggers attacks by trolls? Success. If your head sticks up above the cyber-crowd in any way, swarms of virtual vipers may be attracted to your work and attempt to destroy your career. The situation is on-going and is so bad that I’m not going to say any more about it. I have a number of instances (that most writers know about) that I could cite, but the authors involved asked me not talk about them. What do these examples involve? Death threats. Professional destruction. Really nasty verbiage flung hard. Books sunk by coordinated attacks of one star reviews. Do you feel fear? If you don’t, you’re not on the writer side of the aisle. Let’s get to something more pleasant: The STUPID REVIEW, the topic of my next post. And so I wondered just how long I would have to wait to find out her definition of a “stupid review” is and why she would find them more pleasant. It was truly all I could do not to post a comment on her blog to the effect that she must think the only valid reviews are the ones she buys, but in fact I didn’t. I didn’t do anything. I wanted to see what she was going to say about reviews. Her next blog post came on 9 August 2014. Note that she’s now referring to her previous blog as having addressed “vicious” reviews. And again, my fingers were itching to respond to her “How Reviewers Can Keep Authors as Friends” comment with, “Shouldn’t it be the other way around? Shouldn’t authors want to keep reviewers as friends? And what ethical reviewer would want to be friends with you anyway?” But I didn’t. This long rant now takes readers to task — readers who bought and read her book! — for making mistakes. They liked the book but thought it would have been better suited for children; they apparently didn’t notice that in fact Nathan had marked the book as a children’s story. One reader opined that she liked another of Nathan’s books, a novella, but would have liked it longer. That last wasn’t good enough for Nathan. With all the information that should have told the buyer what s/he was buying, this happened. In the very short review Nathan cuts and pastes, there’s no indication that the reader didn’t in fact know it was a novella. She just said she wished it were longer. There’s no indication that she was upset at not having a sequel. She just said she wished it were longer. Yet Nathan calls this a “stupid” review? She does, because reviews are for her and should be written the way she likes them. If there is anything the reader doesn’t like about the book, Nathan expects the reader to bring those questions, comments, complaints directly to her. (“I have a contact page on my website that sends messages right here. To my desk. You could email me in seconds if you wanted to. If you’re clever enough, you could probably march up my driveway in an hour and a half.”) What they’re not supposed to do is post their reviews in public for other readers to read.
. . . [A]mong the most sensitive creatures on the planet. That’s why we can write. I would like the people who review my work to exhibit the courtesy and commitment to excellence I try to show them in my writing. Courtesy and commitment apparently aren’t the same as honesty and integrity. Seems innocent enough, doesn’t it? A nice, if maybe a little effusive endorsement of a book the reviewer enjoyed. But remember what I said about a few purchased reviews make all reviewers — that’s not a typo; I mean reviewers — suspect? After seeing that Ms. Nathan had bought reviews from fiverr and that Tammie Lynne Smart runs a promo business, all the other reviews came under scrutiny. Melanie Rigney, who wrote such a sweet little review of Sandy Nathan’s book, is in fact the book’s editor. Are any of the reviews of Sandy Nathan’s books, on Goodreads or on Amazon or anywhere else, legitimate, honest, consumer reviews, posted by disinterested readers who either liked or didn’t like the books? Nathan admits she unpublished one book to flush the bad reviews, then edited and republished the book. Is that what she calls courtesy and commitment to excellence? Contrary to anything Ms. Nathan may think, I take no pleasure in posting this. If I did, I probably would have posted it long ago. I guess I thought maybe it would go away, or I was wrong in what I saw or how I interpreted it. I’ve been wrong before. But this is not right, and it’s doubly not right because people like Sandy Nathan think they’re just somehow entitled to get away with it. I’d much rather spend my time reading or writing or making jewelry or hiking out in the desert or just taking a nap. And I’m sure people like Ms. Nathan wish I’d do any of those things and just leave them alone so they can write their books and buy fake reviews for them and lambaste the real reviewers. But the real reviewers are real readers, and real readers are any author’s real friends. I stand up for my friends. Welcome to Tez Talks, a blog series on books and publishing from a reader’s perspective. Today we examine the recent social media behaviour of New York Times Bestselling Author Chelsea Cain, and what we can learn from it. Meet your fiverr Reviewers here! Another post from Linda Hilton on the problem of paid reviews. Yes, it’s true. There are paid reviews on Amazon and Goodreads. Some of those reviewers have been identified. In the cases where sufficient evidence has been presented and Goodreads staff has chosen to act upon that evidence, reviews have been removed and accounts terminated. As far as can be determined, no reviews or accounts have been removed from Amazon, even though Amazon has similar prohibitions on “commercial” reviews. How many reviews are we talking about? Let’s get some numbers from Amazon profiles just for the reviewers who have been removed from Goodreads. That’s right, folks. Three reviewers, 1500 reviews. Almost all of them are 5-star ratings.